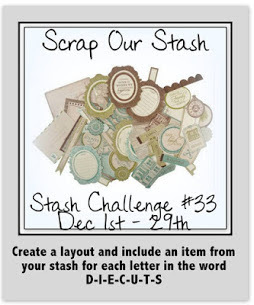 "Hi everyone Carole here with you today and this fab stash challenge. Jess did a photo shoot recently and I cant stop using the photos as they are so lovely. This one was taken at our local beach in October, a very chilly day, Jess has a wet suit on under the dress and top!!! For this challenge we had to use an item from our stash for each letter in the word DIECUTS. E - Envelope, C - Clocks, U - Uniball pen,T - Tag, S - Shells. I hope you like it and visit all the designers blogs for lots more information. You can see a list of the stash i used and a How To Do This Page on my blog. Have a happy scrappy day, bye for now." 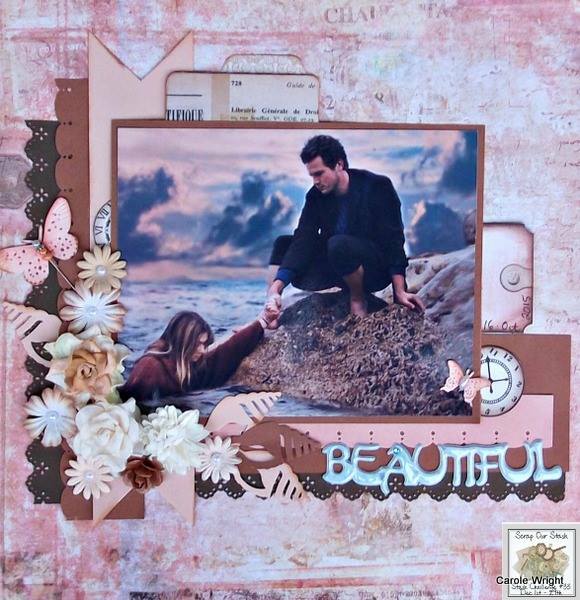 Remember, you have until the 29th to upload your layout for a chance to win the monthly prize. In addition, there will not be a sketch challenge this month. Enjoy your holidays and we will be back Jan 1st with fun new challenges! Awesone work, and great use of all of the elements. Stunning photo, Carole! I love your layout! So beautiful Carole. Love it.